After a brief hiatus, this year's exodus of ad sales chiefs has begun again. Geri Wang, president of ABC Sales, announced today that she will retire in March. "It has been an honor and a privilege to represent ABC for these past 27 years," Wang said in a statement. "I truly love ABC: the people, the programs, the ideals. It's been a magnificent journey, and I want to thank my team for all of their hard work, their brilliance and their friendship. No one is luckier than me." Ben Sherwood, co-chairman of Disney Media Networks and president of Disney|ABC Television Group, said in a statement: "While we all understand and respect Geri's decision, she will be greatly missed—both inside Disney|ABC and around the globe with our many clients. Geri is a force of nature—one of the best and brightest in our business. Relentless in her commitment to ABC, formidable at the negotiating table and a fierce advocate for all clients, she has raised the standards of everyone who works with her. We all wish her the very best, no one more than I." Wang, who was No. 9 on this year's Adweek 50, has led ABC sales since 2010. She started working at the company as a daytime planner in 1990, and in 2000 was promoted to svp of prime-time sales. Even though the network slipped to fourth place last season in the 18-49 demo, Wang was able to deliver CPM upfront gains of as much as 10 percent, double the previous year's increase. 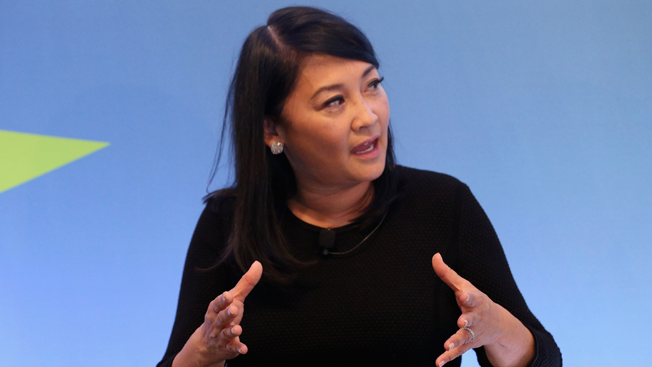 Overall, she is the sixth major ad sales chief to step down in 2016. In addition to Byrne, AMC Networks' Arlene Manos said in September she'll transition to president emeritus at year's end. Two days earlier, NBC Sports said Seth Winter would be stepping down as its ad sales chief and will stay with the company as an advisor through 2018. Dan Lovinger has stepped in as the new sports ad sales chief. Joe Abruzzese, who spent 46 years in the business, announced his retirement from Discovery Communications in July, while Jeff Lucas announced in June that he was exiting Viacom to become Snapchat's vp and head of global sales.